Just a bit behind on the posting, but not behind on the project. I’ve been spending a lot of time on the job-site making sure that all of my design concepts and plans are being translated perfectly in real life- which means a bit less time in front of the screen. Some times that is more challenging than other and there are technical things that get in the way and new designs and solutions need to come to fruition. That’s the part of the job I seriously love- those design opportunities! DESIGN TIP: Don’t for get a shampoo niche! Make it twice as tall as your tallest shampoo and put a shelf in the middle. And put it on a wall you can’t see from the main part of the bathroom… it’s just never pretty. The shelf will go right where that line is. Oct 21: I am loving the materials in this master suite! It’s just such a yummy mix of textures! 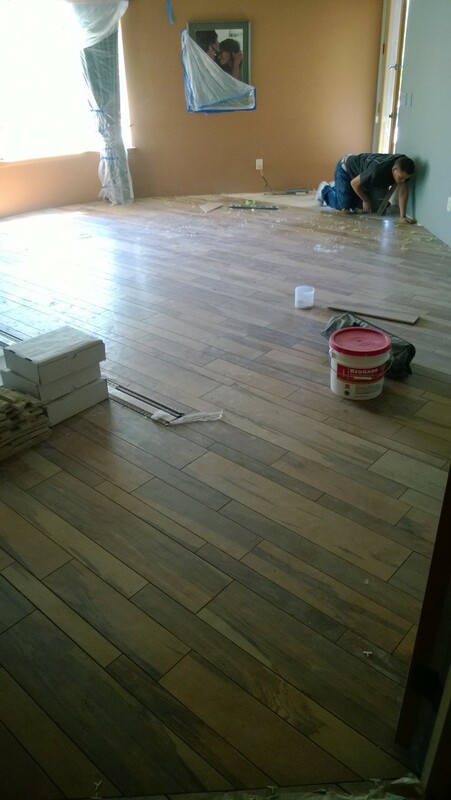 The wood-look porcelain tile that is on the floor is just gorgeous! 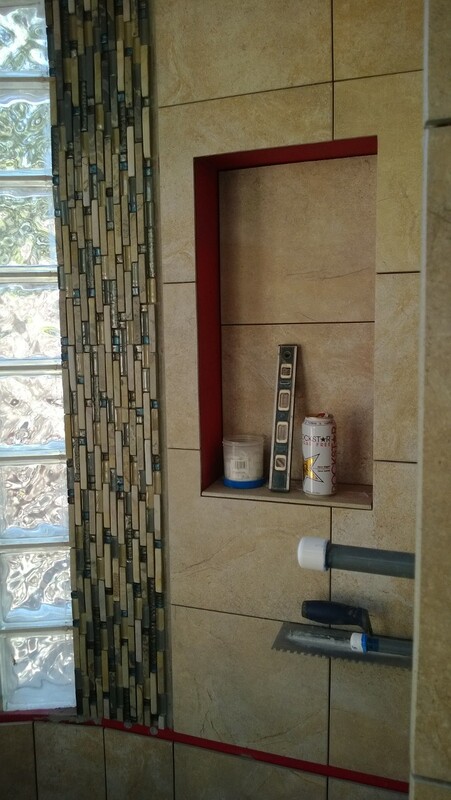 The client was instantly drawn to the strong contrasting pattern in each plank and I chose to use four different sizes… which the tile setters were very apprehensive about. But I know their capabilities and was confident it would be amazing and it is! Rumor has it, that it’s their favorite too! Lest ye doubt me! Oct 23: The fireplace tile in the master bedroom is going in! Here’s Antonio perched atop a homemade scaffold getting up close and personal with the glass tile inset. 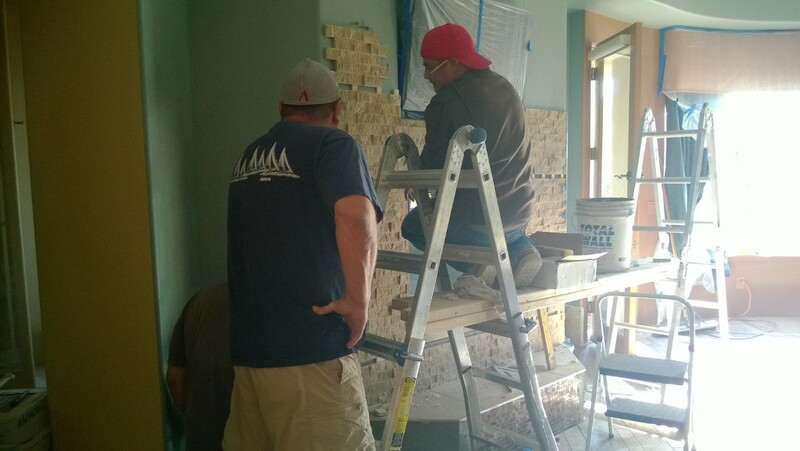 And that’s my favorite tile contractor- Dan Bohlman with Harvey Tile, closely supervising. They always say to me, “Why do you always have to make it complicated?” I just smile and say, “Because that’s how my brain works and that’s how you get to fabulous!” It’s all in the details! 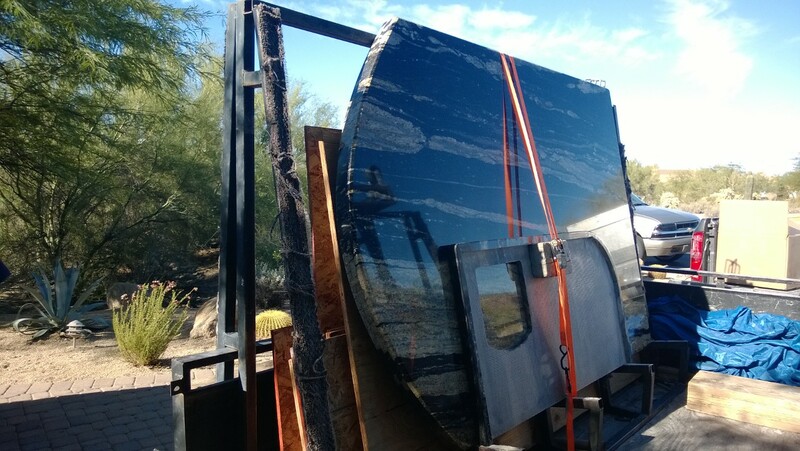 The granite came today- here’s the island granite still on the truck. Love the movement- so dramatic! 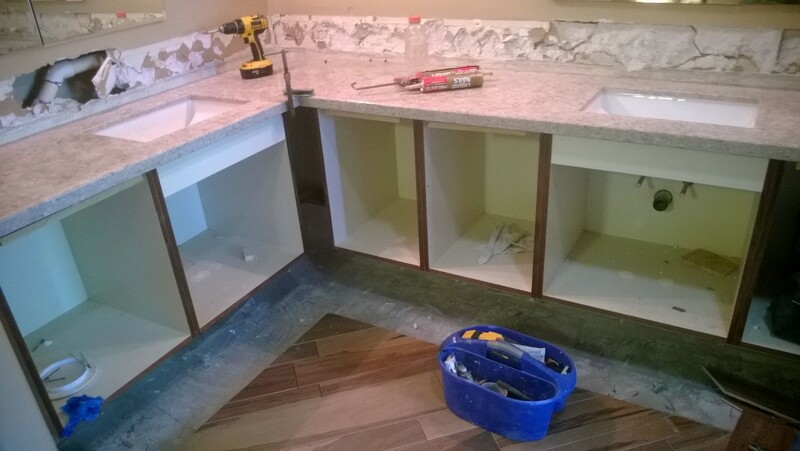 In the master bathroom, we chose something a lot more calm and serene and wanted it to be stain resistant, so here is Silestone Quazar. I’d show you the granite for the perimeter but… well… they put the wrong edge detail on it. I almost threw up, but I knew it couldn’t end this way. People make mistakes (even me) and it’s never about blame and shame, but how you handle it and solve it. They took the slabs back to the plant within the hour, recut and polished the edges and brought them back the same day. Amazing service and you would never know it happened. Pictures to follow in the next post!